Background: Fergana sued the SCA in November 2012 for illegally and extrajudicial blocking access to its website in Kyrgyzstan. In the interview, the SCA head further explained that the letter his agency sent to ISPs in the capacity of “a state agency to fulfill the Zhogorku Kenesh-adopted statute on blocking access to the website. Although laws indicate that doing so can be done provided there is a court ruling to that effect. While the SCA had no right to order the [communications] operators [to block access], we still had to respond to the decision the parliament adopted. Therefore, we have written and sent that letter-recommendation. We are bureaucrats, hence our compliance to fulfill whatever is written on paper,” Mr. Kadyrkulov said. The court proceedings were about to culminate with the SCA attempting to shift responsibility for illegally blocking onto ISPs and the parliament, but the trial was put to rest due to the “expiration of the statute of limitations.” We asked our lawyer, Mr. Nurbek Toktakunov, who represented Fergana’s interests in court, to comment on the matter. “I believe there were no legal grounds for accepting the SCA motion in this regard. I have learned about said letter [by the SCA to ISPs] only on 1 Nov. 2012, when Fergana Chief Editor Daniil Kislov contacted me seeking legal assistance. I did not know before, nor could I have known, about this letter and that the ISPs blocked access to the website based on that very letter. “The limitation period [for filing a lawsuit] can be applied on actions that have been committed in a specific date and time. The blocking of access to Fergana is an ongoing and continuing violation; therefore, the limitation period is inapplicable in this case. But the Judge decided to ignore common sense and stopped the trial. I believe this is limiting citizens’ access to justice. Of course, I will appeal the ruling and I am outraged that the case was not properly considered. Fergana: Almaz Kadyrkulov told the Vecherniy Bishkek newspaper that ISPs could unblock access to Fergana. Can this be considered an official statement? Toktakunov: Of course, it can. The SCA representative told the court that the letter they sent was only of recommendatory nature. The SCA stated the same in the letters they sent to us in response to our lawsuit. It was clear from the very beginning that the ISPs had a lawful right not to comply with the SCA letter in question. But given the overall situation, we still believe the letter bears an administrative and repressive nature. The ISPs depend on the SCA, which is authorized to regulate the information space in Kyrgyzstan. The SCA issues and extends licenses, and the letter reminded the ISPs once again that they were licensees. I believe it is up to the ISPs now, since they can unblock access to Fergana fearing nothing. Fergana totally agrees with the SCA chief: the ISPs have the right to unblock access to our website. However, there is one thing we don’t share his views about: the alleged low number of visits. “Nobody was interested in this website until the court hearings started; they had about 20 to 30 visitors, and then all of a sudden – bam! The website is not interesting at all,” Mr. Kadyrkulov said. He thought the entire court proceedings were a PR-stunt on our part. 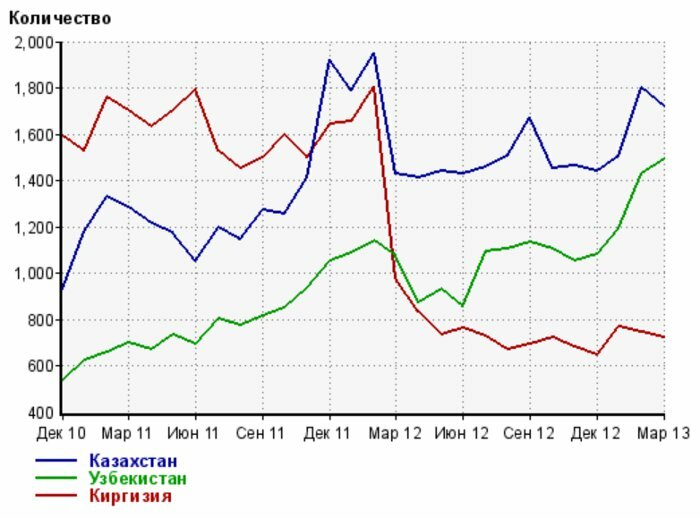 In response, we will simply show him a publicly available statistics on the number of hits and visits of the Fergana website, below. 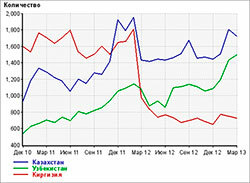 The chart above shows the number of visits from Kyrgyzstan, Kazakhstan, and Uzbekistan. The vertical axis indicates the number of unique visitors, while the horizontal axis indicates the amount of time spent reading content. 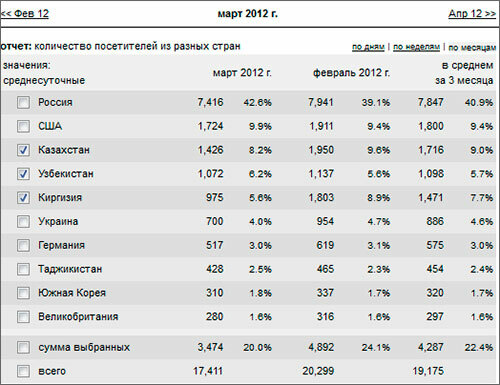 In February 2012, just over 1,800 unique visitors from Kyrgyzstan opened the website in their browsers. In March 2012, after access was blocked, the number dropped to 975, while April saw only 833 unique visitors. This chart does not include visitors accessing the website via proxy servers. However, our readers learned and found ways to bypass the blocking, which was illegal in the first place and now makes no sense either, so the numbers are back in previous figures. The chart is clear on the latest visitors: On 27 Mar. 2013, 948 unique visitors accessed the website from Kyrgyzstan. This fact, of course, is not a PR-trick result, but a clear indication that our content is interesting and important for many Kyrgyz citizens and the illegal blocking is depriving them of their right to access information. The latter, by the way, is guaranteed by the constitution of Kyrgyzstan.